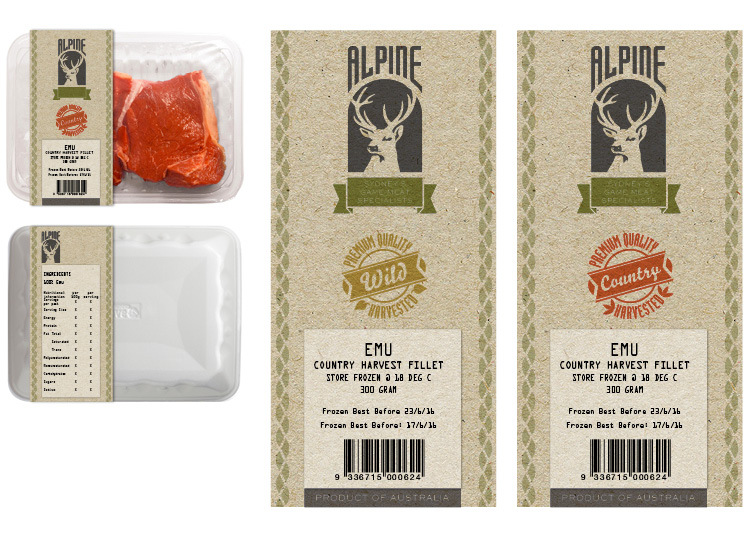 Alpine Game Meats was established by deer breeders in the early nineties as a vehicle in which to sell venison into the Sydney market. It has since been developed into a game meat specialist, producing a wide range of the highest quality meat products such as kangaroo, emu, crocodile, buffalo, camel and game birds. Alpine had an existing logo which had some traction in the industry and our client did not wish to lose that, so we treated this as a branding refresh rather than a new direction. However the detail in the existing logo made it difficult to adapt to smaller applications and the colour palette was clinical. The logo was simplified and the type strengthened to create a more adaptable brand. The colour palette was altered to a more organic range of earthy colours that better reflected a quality food product. We also introduced a raw cardboard texture to add to the organic nature of the product. To date we have produced packaging and promotional posters, with a website in the works.